Sydney Shop Girl: Les Bleus. The Beautiful Game. Bastille Day at The Rocks. Les Bleus. The Beautiful Game. Bastille Day at The Rocks. If you're French, I suspect you are more than just a little bleary eyed today. Congratulations Les Bleus on your dazzling World Cup win. I'll be the first to admit that I don't know the first thing about soccer and what constitutes a good game but every time the World Cup rolls around, I find myself watching the news and scrolling on my phone for live updates. Soccer is a beautiful game to watch and it had a beautiful way of uniting the citizens of a nation. Teams are often made up of players from a diverse range of social and racial backgrounds and I get a little something in my eye seeing the unity and team spirit of each team member. I love the high octane glamour of the players' lives off-field (as a long-term Team Beckham fan, that really goes without saying), I love how dressed up both the players and their managers are for any given match. I learn a little more about the world each time I listen to interviews of players and how they came to be world class players, often achieving in spite of (or perhaps it's because of) seemingly insurmountable challenges. 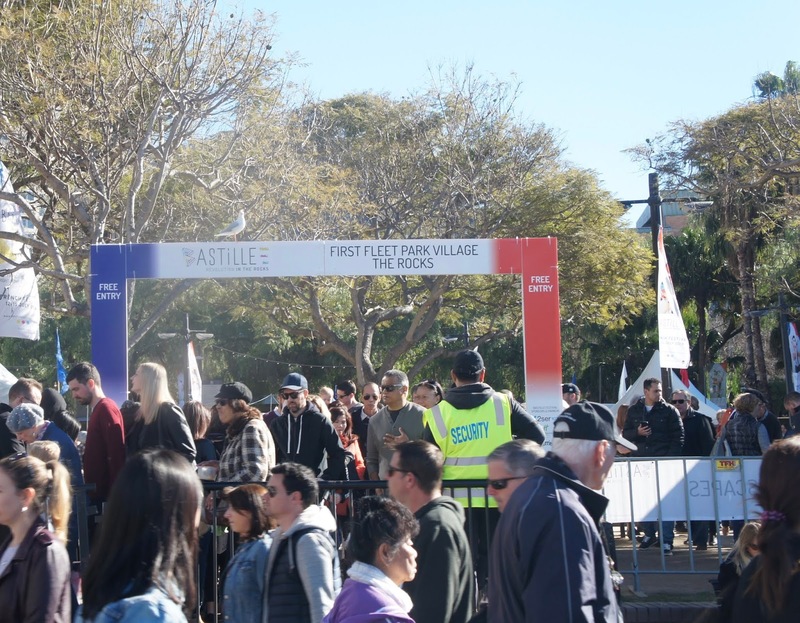 It was also Bastille Day on Saturday and in Sydney it was like the perfect omen for France's game on the Monday. We had clear blue skies and glorious winter sun. It might have been too close to 4C for much of the morning but still, it was a cracking day. Champagne was drunk and iconic French luggage and textile houses were heartily endorsed. The Bastille Day celebrations in The Rocks did not disappoint and they were the perfect reason to set out for the city to enjoy the glorious winter sun. 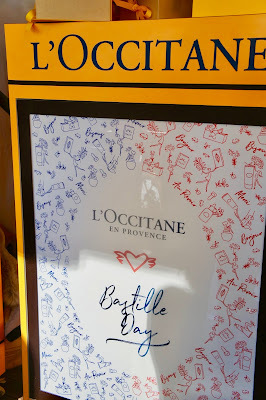 The festival was a celebration of all things French and fabulous. L'Occitane ensured that we were all lavishly scented and moisturised with a wide range of their favourites on hand to try and buy. Patriotic cakes were on offer next door. Breton shirts festooned another stall. Patrons and stall holders dressed patriotically. 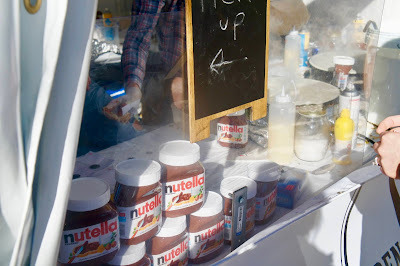 There were crepes available with all the traditional fillings although I think Nutella is a bit of a cross-cultural interpretation filling wise. Food, wine, music and sun. 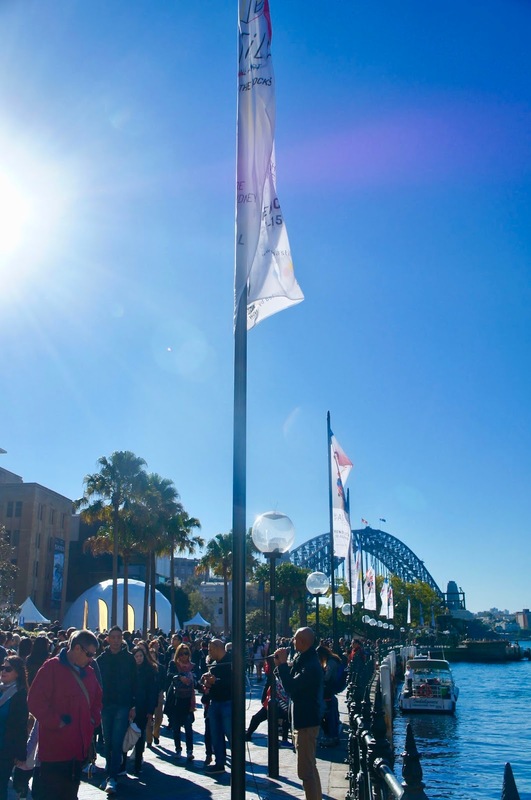 What more could ask for on the weekend during a Sydney winter? There were more stalls across the road in the foreground of Custom's House. These cones of cold meats and cheese had a special name which I've forgotten. French praline made in front of you. More crepes and more Nutella. 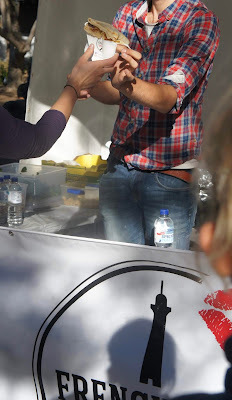 The rillettes stall was fascinating to watch. Multiple cast iron pans simmering away, bread and cheese being grilled on the sidelines. The team were working with military precision to keep it all cooking briskly before serving up to the long lines of hungry punters that stretched across the footpath. 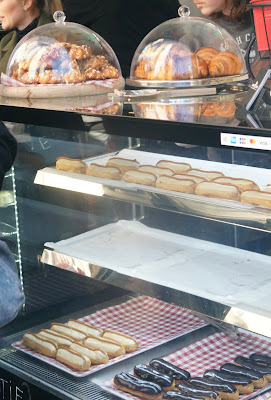 There were trays of perfectly glossy eclairs. If I wasn't already so full, I'd have snapped one up. Good old chocolate, the OG eclair topping would've been my pick. 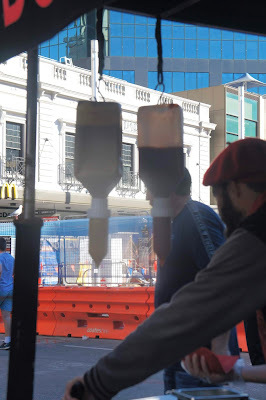 Those nozzled bottles hanging upside down at the hot dog stall are a pretty nifty way to dispense ketchup and mustard, don't you think? Wonder if I could arrange something similar in my kitchen. That way I'd never again fall prey to that bit of ketchup that gets propelled onto my top every time I try to tap the bottom of an almost empty bottle to get those last dregs out. Did you celebrate Bastille Day or the French World Cup victory?